These two are similar, yet each offers its own unique character. Regents Flake starts as a base of red and bright virginia leaf, seasoned with generous amounts of fine oriental tobaccos. A very small percentage of perique is added to enhance the fruitiness of the virginias, as well as to work its magic amplifying some of the lovely exotic, almost floral qualities of the orientals. Pressing and aging in cakes brings out the best of the leaf, after which the blocks are cut and sliced into flakes. The aroma is rich, malty, fruity and just a little earthy. In the bowl, beautiful virginia flavors, subtly sweet, are enhanced by the spice and sweet/tart character of the orientals, and the room note is wonderful. Temple Bar is made from the same components, but optimized for presentation as a plug. (Temple Bar. See what I did there?) Sliced across the grain, thick or thin, and rubbed out to your preferred texture, the taste can go from subtle to intense, with a similar flavor profile to Regents Flake, though slightly more rich and fruity from the continued anaerobic fermentation that takes place within the plug. Sixpence is a rich flake comprising a base of beautiful red virginias, a generous portion of perique, and just a bit of dark-fired leaf to add body and dimension. The tobaccos are delicately kissed with special spirit, then pressed and aged in cakes before being sliced and tinned. The taste and aroma are deep, full and satisfying, reminiscent of traditional tobaccos from long ago. The leaf has been carefully selected and composed to perfect harmony from first light to the wonderful crescendo of the last puff, holding the smoker's interest throughout the bowl, while developing increasing nuances with each puff, without fatiguing the palate. Virginia lovers craving something bold and robust, as well as devotées of mixtures who enjoy virginias as a change of pace will find their reward in every bowl of Sixpence. As with all G.L. 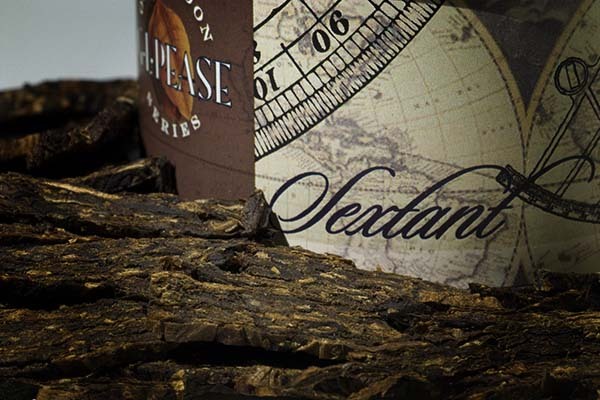 Pease blends, this one will age beautifully in the tin, developing added complexity and refinement through the passing years. Open the tin. Discover the mystery. Gaslight is the seventh blend to join the Old London Series, and is a bit of a departure. A classically English styled Latakia mixture, pressed and aged in cakes, then cut and delivered in one-ounce bars. Easier to handle then the two-ounce brownies of JackKnife and Triple Play, these bars are sliced easily, and rub out effortlessly. 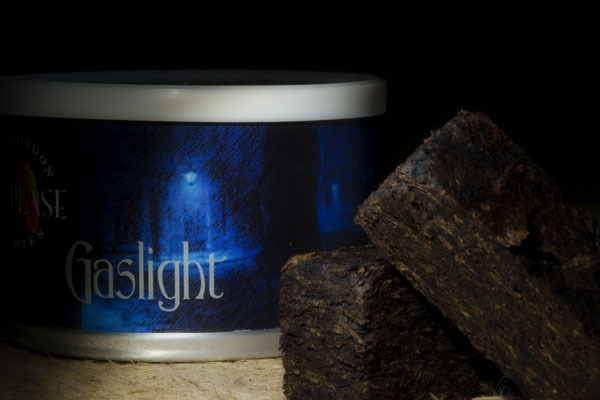 Deep, rich and full flavoured, Gaslight burns very slowly, delivering a lingering, satisfying smoke for the true connoisseur of Latakia based blends. The red virginias present a background of natural sweetness, whilst fine orientals provide just the right amount of spice. I like it best sliced thinly, rubbed out and packed loosely in smaller bowls for a satisfying, surprisingly long-lasting smoke. 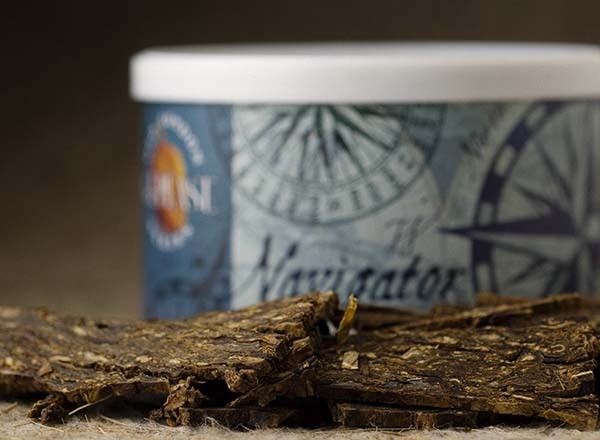 Navigator, the sixth blend to join the Old London Series, has been created specifically for the fancier of fuller-bodied, but still well-balanced and sophisticated flakes. The addition of a bit of dark-fired leaf brings depth and complexity to the party, a touch of rum makes the red and bright flue-cured tobaccos dance, enhancing their natural fruitiness and polishing the edges. The pressing and aging in cakes brings it all together into seamless harmony. As with Sextant, the flakes are easily broken and rubbed out to your preference. The smoke develops beautifully in the bowl, each sip satisfying, rich, and perfectly balanced. A classic mixture harmoniously married to a Navy flake. Ripe Virginia tobaccos are first blended with Cypriot Latakia, fine Orientals, and a touch of dark-fired Kentucky leaf, then infused with a hint of dark rum before being gently pressed, matured, and sliced. The flavour is rich, bold and satisfying; the aroma an enchanting interweaving of traditions. The fifth entry in the Old London Series, Sextant, defies categorization somewhat. While it has many similarities to a conventional, traditional mixture, the infusion of dark rum, and the addition of fire-cured Kentucky, especially when combined with the pressing and fermentation that occurs as a result, give it a unique sweetness and aroma. The rum offers a subtle but engaging contribution throughout the smoke, which is rich, deep and complex. It is not an aromatic, for those who are wondering, nor can it be considered the typical sort of "crossover" mixture. It truly is the seamless integration of a traditional mixture with what many think of as a Navy Flake. The flakes are not firmly packed, but are kept looser than a conventional flake, and therefore easily broken. If pressed tightly for too long, the overall character, especially of the Latakia, would soften too much, and some of the liveliness would go missing. Holding it just long enough to integrate the flavours is the key, the reult being a highly satsifying and refreshing new mixture. A luxurious blend comprising generous portions of Cyprus latakia, ripe red virginias and fine oriental leaf with a bit of bright added for a hint of gentle sweetness. Pressing and aging in cakes integrates the flavours and partially ferments the tobaccos. The cakes are then sliced and tumbled into ribbons, ready for your enjoyment. Lagonda is the latest entry in the Old London Series, and though it shares production methods with its siblings, Chelsea Morning and Meridian, it's nevertheless all new. Lagonda carries a higher proportion of Cyprus Latakia than the previous blends in the series, and a more pronounced oriental component. It's spicy, but not aggressively so, and dry, in the sense of not being sweet. It's a savory misture with mouth-filling flavours, and a wonderful aroma, both in the tin and in the air when it's smoked. The virginias give the mixture legs to stand on, but aren't the dominant note. Despite it's big flavours, the blend maintains finesse and balance, which was a bit of a challenge with something so full-bodied. It has a lot to offer, but doesn't overpower. It'll age beautifully, but is smoking fantastically right out of the gate. If I sound like a proud papa, it's because I am. Like any child, this one took some interesting turns during the early stages of its development, sometimes making me think it had a mind of its own, and it would never grow up to amount to anything. But, it did, and the result is even more than I was hoping for when I first started on it. If you've enjoyed the other blends in the series, you'll love this one. If you've been a fan of mixtures like Westminster, Abingndon, or Charing Cross, you'll also find something really enjoyable here. 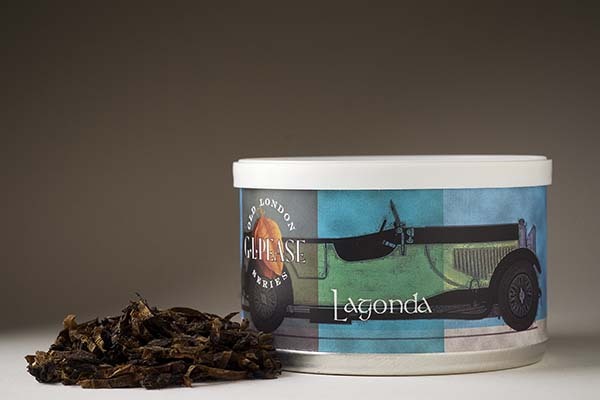 If you're used to somewhat sweeter mixtures, like Maltese Falcon, you should still give Lagonda a go. It's lovely stuff. Meridian - balanced, poised & sophisticated. Cyprus Latakia is layered with fine virginia tobaccos and small leaf orientals, then pressed, sliced and tumbled into ribbons. More savory than sweet, with classic structure, medium body, and captivating complexity, Meridian is the perfect companion for a mid-day stroll or with the afternoon tea. 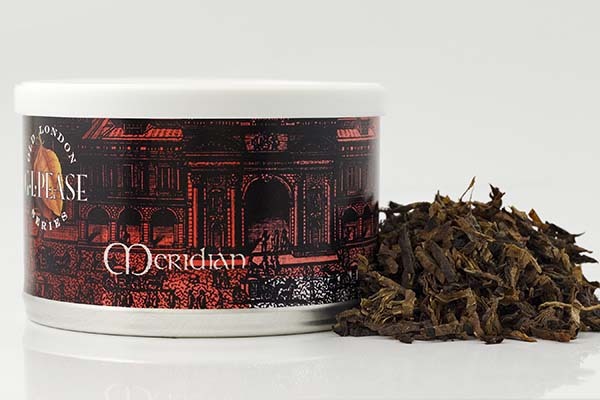 Meridian is the third entry in the Old London Series. A classically styled blend that's wonderful when young, but with a good backbone for longer aging. It's a medium-full mixture, with flavours that evoke memories of some of the great Latakia blends from days gone by. Red and orange virginias are joined by a generous, but not overwhelming measure of Cyprian leaf, for a wonderfully earthy foundation. The spicy/sweet oriental tobaccos add fullness, and an exquisite aroma. Not as "big" or as full as Westminster, but similar in style. An excellent blend for a relaxing afternoon smoke, or as a delightful amuse bouche before dinner. Quiet Nights - rich, deep, contemplative. Ripe red virginias, fine orientals, smoky Cyprus latakia, and a pinch of Acadian perique are pressed and matured in cakes before being sliced. The sophisticated flavors and exotic aroma provide a wonderful backdrop for quiet moments of reflection, a good book, and if you are so inclined, perhaps a wee dram. This is the second entry in the Old London Series. This one is fuller and somewhat more Latakia-forward than Chelsea Morning, with a higher percentage orientals, and less perique. It's rich, complex, leathery and smoky, with a naturally sweet structure from the darker virginias, and a balanced oriental spice. It compares in strength and fullness with blends like Samarra and Blackpoint, but the pressing makes it deeper, darker, and brings new dimensions to the flavours and aromas. It's really wonderful. An ideal addition to the series, perfectly complimenting a relaxing evening. Chelsea Morning is made from a variety of sweet red and bright virginias, fragrant orientals, a small measure of rich Cyprus Latakia, and a pinch of L.A. Poche’s brilliant Acadian perique. It is an easy to pack, easy to smoke tobacco, and a great blend to start the day with your morning cup. The flavours are lively and engaging, with a subtle fruitiness and gentle smokiness that wakes up the palate. For those expecting a Latakia powerhouse, this ain’t that. The Cyprus leaf provides depth and character; it’s certainly present, but it’s not the dominant voice. 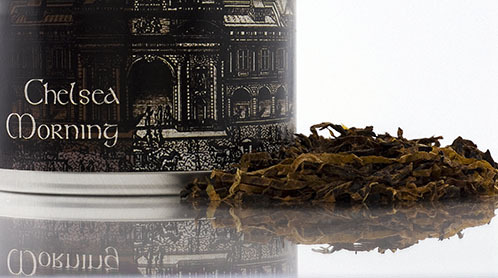 In that respect, Chelsea Morning is similar to Piccadilly, the ‘English Breakfast Mixture’ from the Classic Collection, but, it’s also very different; the orientals add additional dimensions to the smoke. It's really a delightful blend. Of course, it would be silly to say that it’s only enjoyable in the mornings, but to my tastes, that’s when it shines its brightest. I’m very excited about this new blend, and the entire series, which I'll be finishing up over the coming months, and releasing as they're ready to go. And, just because I know someone will ask, no, it is not a ‘clone’ of that other famous tobacco with ‘Morning’ in its name. But, if you liked that one, you should certainly give Chelsea Morning a try. It's already getting some great reviews! The tobaccos in the Old London Series are made using old, time honoured methods utilized by some of the old blending houses. Whole strips - leaves with the mid-ribs removed - are blended in layers and pressed into cakes, and briefly matured to allow some fermentation, and for the flavours of the tobaccos to integrate. The cakes are then sliced traditionally, and either left in flakes, or tumbled into a form that is something between a ribbon and a broken flake. This method brings out and enhances the subtle, natural flavours and aromas of the component tobaccos. They're a little more work to produce, but the results are well worth the extra steps. These blends offer something unique in today's world of cost-cutting, production shortcuts and chemcial "enhancements." My intention was to turn back the clock and use traditional methods to produce mixtures reminiscent of those that haven't been around for decades, but modern in their formulations. The collection will never be a large one, but each will be unique, and will provide the smoker with a delightful journey, with one foot in the past, and one in the present. As with all of my blends, each of these is designed from the outset with aging in mind. They are of course wonderful in their exuberant youth, but are intentionally created to evolve into an even richer, more elegant, complex and refined experience, sometimes well into their second and third decades… If I can keep any around that long. I'd been smoking prototypes of the first in the series, Chelsea Morning, for several months at the time of its release, and am now truly thrilled with the way it's developing after a couple years in the tins. The orientals and virginias present a slightly sweeter, more fruity profile, whilst the perique and latakia continue to stand up well. Over time, the latakia will, of course, soften, but other aspects will increase, so while the overall profile will change, it will continue to be a wonderful smoke for many years. 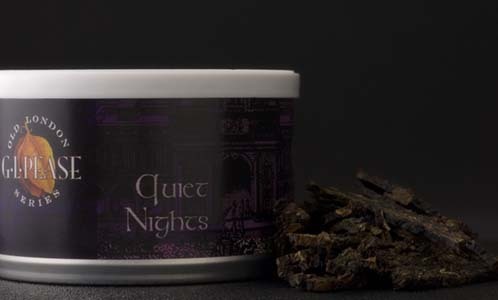 Quiet Nights, too, shows amazing potential for long aging. The first prototypes are a bit over a year old now, and have darkened and matured beautifully. It's fantastic fresh out of the press, but the years will bring more sophistication to the smoke. Enjoy it now, and put pleanty away to sample over the next five to ten years. Meridian is so classic in its style and structure, I can't imagine it not aging really well. At the time of its release, the oldest prototype was only four months old, but was already showing an increase in complexity and depth. Now that I've smoked some with a little over a year behind it, I can safely say that it's destined to be delicious well into its second decade, like some of the classic mixtures of legend. Now that I've had some time to spend with Lagonda, really enjoying its "bigness," it's quite evident that it'll develop remarkably well for at least the first five or six years, though, since it relies fairly heavily on the intensity and exuberance of its Latakia content, I don't see it as one for the really long term, and a decade might be pushing it. But, I've been wrong before. Gaslight is going to evolve over time into something remarkable, I think. I love its richness young, but as the virginias and orientals continue to ferment and mature, they'll dvelop increased complexity and the balance will shift, after years in the tin, to a somewhat softer latakia experience with a broader, more exotically spiced breadth. I'm looking forward to continuing to explore this one over the coming decade or two. Sextant and Navigator, after about a year, are developing delightfully. The rum used in the processing begins to integrate more completely with the whole after a few months in tins, rather than riding a little above the wave as it does when it's first produced. Time will tell where this one goes, but I'll update with my observations after another year or so.